Let’s face it, the cost of living isn’t going to go down any time soon – in fact it seems to be getting higher by the day, so what can you do when you want to make your pay stretch that little bit further? Meet the sharing economy, a wonderful place filled with sites that let people share what they have. This could be giving someone a lift in your car, helping them out with a place to stay, or even just giving someone your spare time to change a lightbulb. More and more people are starting to learn just how cool these services are, and how much money they can save, so here’s our personal pick of the best ones you probably haven’t heard of yet. Research shows that there are 5.8 million people in the UK living in what’s called ‘deep poverty’ and are unable to properly feed themselves. But at the same time, there are around 3.9 million tonnes of food wasted across the country each year – that’s enough for 800 million meals. Sharing site FareShare spotted that something was amiss, and now receives surplus food from the food industry and thanks to a team of volunteer drivers, delivers it to over 1,700 charities and community projects across the UK, such as breakfast clubs, women’s refuges, homeless shelters and lunch clubs for older people to help feed those in need. Don’t you hate it when you’re gearing up for your work’s weekly football match only to discover that half the team can’t make it? Or how about if all of the local sports centres are suddenly fully booked and you have to cancel? You can make those pains a distant memory with OpenPlay. Using this site, sports teams can research and book sports venues all over the UK, while checking out available slots, opening times and directions all from the same page. Teams can also place adverts for new members, while individuals can put themselves on offer to anyone needing an extra player. Don’t let the name throw you – StreetBank isn’t a money-lender, but it’s the UK’s biggest neighbourhood sharing site. Let’s say you’re doing some DIY and you can’t afford that new ladder you kept on meaning to buy. With this site you can do a local search and borrow one from a member in your area, totally free of charge. It’s not just for housework either, as StreetBank members are sharing garden tools, kitchenware and even their unwanted kid’s toys. You can even donate your time to give people language lessons, or let someone borrow your Game of Thrones box set when they need something new to watch. The sky’s the limit with this one. Like Air BnB, the premise of Love Home Swap is to give people a place to stay while on holiday or whenever they need somewhere to crash. It works a bit differently however, as you can use the site to secure an entire home for the duration of your stay. Many of the houses and flats are quite stunning too. We already covered the notion of sharing time using StreetBank, but the brilliant TaskRabbit takes that concept and simply runs with it. Local expertise is at the core of how this site works, as it’s a big directory of cleaners, handy-people, advice and even an extra pair of hands to help you move house. All of the site’s expert Taskers are thoroughly vetted by the site in person and are on-hand to help members with a wealth of chores, all set to a secure hourly rate payment model. So if you need something done right, or if you simply aren’t confident in your own skills, TaskRabbit will know someone who is. A site for the fashion-conscious, Vinted is a novel concept that works just like a clothing swap shop. Founded in 2008, the site began as a way of reducing the amount of clothes being dumped in landfills each year, and to provide a place for everyday people to sell, buy or swap clothes from major – or minor, brands. Members can snap a photo of their unwanted clothes, set a fair price, and chat with buyers before completing their sale or purchase. Regular visitors will be able to scoop bargains on big name brands like Hollister, Abercrombie & Fitch, Mossimo and Nike, to name just a few. Sometimes all you need is the companionship of a furry friend to make you feel brilliant, and Borrow My Doggy offers just that. 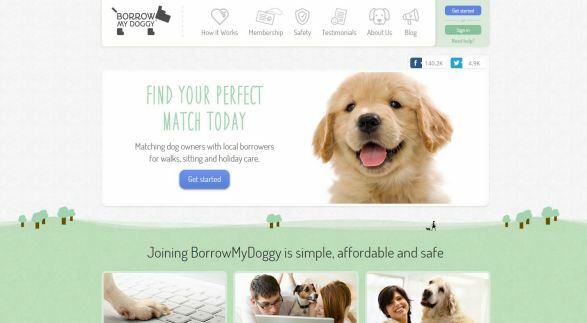 It is a pooch for hire service that is highly vetted to ensure only serious members can take part. They also have to take out an annual subscription fee to make sure they’re serious about looking after their new four-legged chum.You can search for available dogs in your local area, meet and greet their owners, get to know the pooch and set a date for your time together. It’s also a great way to take a holiday and know that your dog is safe while if you don’t like using kennels. It also helps that the dogs are insanely cute too. There’s a big problem with air and road mail right now – namely, all of those emissions are proving to be a real strain on the environment. Piggybee’s crowdsourced delivery service is a great way of reducing that impact, while offering neat incentives for the sender, courier and recipient. Everybody wins, as they say. In short, you are sending parcels or letters with people who are going on holiday or travelling to your target destination anyway. You can also attach rewards for when your courier makes their delivery, such as a lift to their hotel, accommodation during their stay or a lovely home-cooked meal. It’s a neat solution to a big transit issue. This site is essentially a big directory of spare rooms and entire homes available to rent for short or long-term lets, which is ideal for when you’re going on holiday and don’t fancy spending your nights in a cramped or over-priced hotel room. Air BnB members can make extra money on their spare space, while holidaymakers can stay somewhere nice during their travels. Do you fancy staying a week in your very own New York penthouse for less than the cost of a local hotel? Thanks to this site, that is now absolutely possible. Last but by no means least we have HomeExchange, which started live in 1992 as a printed mail order book of home swaps. Founded by Ed Kushins, it has grown into a full social network for those looking for a place to stay while on holiday or away on business. It is now available worldwide in over 150 countries. Like Love Home Swap, the site is cheaper than hotels – up to 58% less than standard holiday fees, and you can use it to rent out your home while you’re off on holiday. So not only are you staying somewhere nice, you’re reducing your own costs by making money on the side. UK car share site Liftshare has been working in this space since 1998, and today it has 420,000 members and a focus on green, affordable shared travel. The site also just launched its first car share app on GooglePlay (and iOS) to help pair up more drivers and passengers on the road. Disclaimer: I may be a little partial since I’m their blog editor! [Author: This is a guest contribution from Dave Cook, who helps manage media content and is blog editor for Liftshare.com, the UK’s biggest and original car share site. No financial remuneration has been exchanged for this contribution]. Dave – who has written 1 posts on The Red Ferret Journal.